Klutz, creator of innovative kid´s activity products, keeps kids entertained with inspired takes on classic arts and crafts themes like Spool Knit Jewelry, Twirled Paper and The Klutz Book of Paper Airplanes, journal-keeping with Me and My Friends; to backseat boredom-busters with Road Trip Trivia and the shockingly colorful Rainbow Hair Styles. This new travel line is popping up on store shelves everywhere. It is a cup with four activity books, stickers, pencil and collectible pencil topper that fits neatly in a car?s cup holder. -- Kathleen Watson from Klutz says this item has been picked up by all of its 13,000 total accounts. -- Variety and convenience are the key features of this product, enabling children to keep different activities close at hand. -- EV Rental Cars will be selling Books in a Cup at their rental locations. This is the first time they have sold travel products. 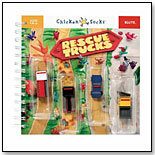 Klutz introduced eight titles of Chicken Socks activity books in February of 2005 and added six more in the spring. 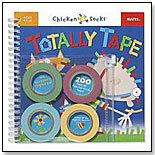 Totally Tape has four rolls of colored tape and an activity book. Kids use the tape to “color in” the black and white pictures. Here´s a step-by-step guide to folding 10 different paper airplanes. This big (10" x 12") book comes complete with 40 sheets of flight-tested, ready-to-fold paper, printed on both sides in a variety of 20 colorful patterns, including leopard print, wood grain, hot rod flames and lose-it-on-the-lawn grass. — Boys love, “Klutz paper airplanes and things that they can do,” reported Kim Walter, manager of 6.5-year-old Giggles in Stoughton, Wis.
— Klutz kits are among kids favorite items, indoors and out, all year round, according to retailers nationwide. “The Klutz Book of Paper Airplanes helps kids make more than just paper toys. It teaches them to create high performance flying paper machines,” Melissa Bloomfield, publicist for Klutz, told TDmonthly in 2006. This book explains how to play over 28 different simple ball games and activities. 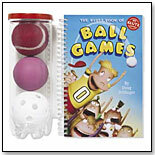 It comes with a cannister that holds three essential balls: a red tennis ball, a power pink ball (or high-bouncing rubber super ball) and a screwball (or a standard wiffle ball). As author Doug Stillinger writes in the book´s introduction, "balls are totally fun." 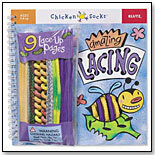 This lacing set comes with a project book that will keep kids entertained for long stretches as they wind the pieces together to form designs that will surprise and delight them. The multi-colored laces fit easily into the zip-up case for fun on the run. The pages of this book fold out and turn into extra-long full-color highways, complete with fallen bridges, flooded highways, forest fires, and other exciting impediments. Kids can flip the fold-outs over to reveal a new set of black-and-white playscapes that invite a lot of color-me-in time. Insructions are included for cool projects such as paper tube tunnels and shoebox bridges. Last but not least, of course, are the hard-working rescue vehicles themselves: a fire engine, police cruiser, tow truck and snow plow. These emergency rigs really roll and are ready to respond to the next urgent call. It´s an entire search-and-rescue team, table-top style. This write-right-in-it book is full of irresistible all-about-us activities: funny quizzes, fill-in-the-blanks, doodle how-tos, messages in code, compatibility tests, lists of favorites, secret identities and more. The book comes with special envelopes and 78 plastic stickers in cool shapes and translucent colors. It?s written by the editors of Klutz.
? Klutz craft books are popular with tween girls at The Wizard?s Chest in Denver, Colo., said owner Kevin Pohle.
? ?Me and My Friends, A Book About Us? is one of the best selling shared tween girl toys at Terri?s Toy Box in Seattle, noted owner Terri Soelter.
? The book comes with a spinning perpetual birthday calendar so girls can always remember their friends? special days. Knitting is simultaneously trendy and traditional. “Knitting” takes kids from step zero (how to hold the needles and yarn) to finished projects they can show off shamelessly. The book comes complete with yarn, knitting needles, a crochet hook, two buttons and a sewing needle. They’ll learn to knit a long skinny scarf, a cozy hat, a sunglasses case, a cell phone sock and more. The book is written by Anne Akers Johnson. — “Knitting” is one of Klutz’s Top 10 favorites on its Web site. — “This has been selling well since January,” said Kelly Smith, owner of The Learning Express in Carlsbad, Calif.
— “Knitting” is one of the best-selling girls sharing crafts at Victoria’s Toy Station in Baton Rouge, La., said owner Katie Culotta. 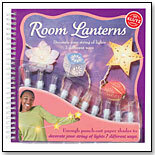 Room Lanterns comes with a string of ten tiny lights, ready to plug in and get glowing. To personalize them, Klutz has bound seven sets of perforated paper shades right in the book. Girls follow the step-by-step instructions to punch out the shades and fold them into shape. Easy-to-use snaps and rings to attach the shades make it simple to secure the shades to the light string. Klutz makes craft books for girls and boys of all ages. — The Klutz line also does really well for girls at Toy City, in Surry, N.H., said owner Steven Levy. — “Klutz craft items are great for tweens,” agreed Kevin Pohle, owner of the Wizard’s Chest in Denver, Colo. The art of thread-wrapping hair braids has never been shown off more clearly, with more fun or more beautifully than here. The kit comes with ten skeins of embroidery thread and thirteen beads and charms for the especially fancy styles. The accompanying book was written by Anne Akers Johnson. — Klutz body-care craft kits were cited by Joanne Farrugia, owner of JaZams in Pennington, N.J. as being a great sleepover activity for her girl customers. — “Klutz always does well,” agreed Sally Lesser, owner of Henry Bear's Park in Arlington, Mass. With Ribbon Purses, girls can make up to 14 bitty bags, with no two exactly alike. Everything they need is included — colorful floss, plush chenille and satin cording, sparkling beads and seven different kinds of beautiful ribbon. Super-simple instructions, clearly illustrated every step of the way, ensure that even beginning crafters will be able to sew and embellish their own dinky designer purses. The biggest question will be how many to keep and how many to give to friends. — Kate Tanner, owner of Kid Stop Toy & Book Store in Scottsdale, Ariz., is betting that tween girls will go for the new Ribbon Purses book/kit. — Susan Sellers, buyer for Tree Top Kids in Washington, D.C., also expects Klutz craft kits to continue to be faves with tween girls this year. — Ribbon Purses launched in March 2006. The Etch A Sketch manual, of course, comes with an Etch A Sketch, but also with a book of ideas, tips and tricks for making things come alive on the board. The screen also comes with 12 overlays to turn it into a golf course, pinball game, maze and other challenging courses to extend the play life of this traditional toy. — "Klutz — all those little pocket games that are fun in the car," was the comment on travel toy best sellers given by Alison Cox, owner of Animal Quackers in Raleigh, N.C.
— Six of 37 retailers named Klutz as one of their best-selling travel lines. — Specialty toy retailers consistently name Klutz a great seller. The Klutz Kids Travel Book is a 48-page backseat survival kit. This super high-quality book comes with a built-in clipboard, 100-page notepad, 47 page activity book and a conveniently attached zipper pouch full of markers, yarn, dice, string and more. 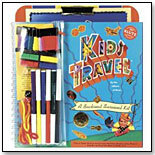 Mazes, Cat's Cradle Loop, Hidden Pictures, Parcheesi Board, License Plate Bingo and Classic Song Lyrics are just a few of the activities included in this ultimate travel kit. It’s a winner of the Parent's Choice Gold Award. — Two of 40 retailers who spoke with TDmonthly in March 2008 singled out this kit as their stores’ best-selling travel item. — Amy, owner of Babies to Kids in Flagstaff, Ariz., told TDmonthly that her store sells “over 20 per month” of this item. — In March 2008, Amy Oliver, owner of Giggles in South Hamilton, Mass., named this kit as one of her stores’ best-selling travel products. This book of personality quizzes for tweens and their friends prompts them to ask such soul-searching questions as, “What Kind of Cookie Are You?” Kids can jot down the answers on a 70-sheet note pad and then compare the results. There are true/false, finish the doodle and flow chart tests to suit all moods and quirks. The flexible book covers also come in different colors: serene green, hot pink and all-about-you blue. It’s written by Karen Phillips. — “Crafts, particularly Klutz books, are very popular,” said Laura Brauer, general manager of Cloud Nine Toys in Sudbury, Mass. — “Klutz just keeps selling, no matter where we have a display. As long as we keep it stocked, it sells,” raved Michele and Ken Gietz, owners for 15 years of Where’d You Get That in Williamstown, Mass. — “We don’t carry much in this area, but we do have Klutz products that they like,” said Kim Walter, manager of Giggles in Stoughton, Wis. Kids can color in these 20 designs on transparent vellum, then hang them in the windows and let the sun shine in. Each design comes with two suggested color schemes. Kids can replicate these by following numbered templates that can be seen through the paper while coloring. Twelve number-coded, double-pointed markers are also included. The book is written by Barbara Kane. — “Klutz crafts … make your own and do your own things,” are popular picks for tween girls, said Heather Downs, manager of The Toy Shop in Bethel, Maine. — “Klutz crafts” are the top-selling toys for 9- to 12-year-old girls at Giggles in Stoughton, Wis., manager Kim Walter told TDmonthly. — Art sets do great at Dancing Bear Toys in Hendersonville, N.C., said owner Erica Evers. 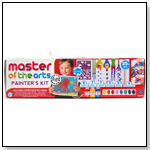 This kit allows kids to spread nonpermanent, kid-friendly paint on a blank page with a foam brush that is designed to soak up just the right amount of water and paint. A paint palette is handily built right into the cover of the book. Pictures that have already been drawn in white on the pages appear when painted. — " I would just say that Klutz always sells well because they have a good product," noted Jean Schwartz, owner of Broadway Toys & Togs in Jackson, Wyo. — "Klutz Magic Painting," was the best-selling painting toy at the Pumpkin Patch in Ames, Iowa, according to manager Barbara Wulkow. Children can “make widgets that work and gadgets that go” with this activity book by Doug Stillinger that includes a genuine Klutz alkaline battery, buzzer, propeller, light bulb, motor and other useful items. Through eight different projects, the product helps kids master the real science behind electricity. It received the Parents’ Choice Recommended Award and was listed as one of Dr. Toy’s 10 Best Educational Products and Dr. Toy’s 100 Best Children’s Products. “Budding scientists will be amp'd with all eight of the kid-tested parent-approved projects, which range from a propelled swamp boat to creating a motorized bugzilla,” publicist Melissa Bloomfield of Scholastic Inc. told TDmonthly. Launch date: August 2003. This is a gorgeous instruction book of common-sense luxuries for treating hair, skin and nails. These simple recipes — for things such as bath salts, tub infusions, hair rinses, facial masks, toners and scrubs — are remarkably easy to follow and yield delightful results. The kit comes complete with a Spa Box of supplies that includes a facial brush, nail buffer, pumice stone, bath infusion bag, headband, three vials of essential oils (lavender, peppermint and tangerine) and more. It’s written by Anne Akers Johnson. Launch Date: Fall 1999. 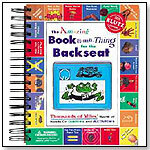 The Amazing Book-a-ma-Thing for the Backseat is a hands-on book of puzzles and games, including a sliding-block puzzle, a pinball-baseball game and a lift-the-acetate Magic Writer. The Amazing Book-a-ma-Thing for the Backseat is the winner of the Canadian Toy Testing Council Three Stars Award, the National Parenting Publications Award and the Parents' Choice Approved Award, and was named Outstanding by Parent Council. — "The Klutz kids travel is terrific," said Amy Barrett, owner of Lasso the Moon Wonderful Toys in Helena, Mont. 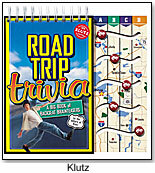 Five retailers agreed in spring 2007 that Klutz travel is tops in their stores. — While some retailers in the Southeast reported sporadic sales of the Klutz game books outside of summer, others suggested that 30 units sold per month was a more consistent figure for them. — Owner Linda Angel of Kidoodles Toys in Norman, Okla., told TDmonthly in spring 2007 that Klutz is one of her favorite vendors. This building set includes more than 275 cards that allow users to construct their own version of the Hogwarts School of Witchcraft & Wizardry. Sturdy slot-to-slot construction means there is no need for glue or nails and the cards can be taken apart and reassembled over and over again. The instructions feature assembly hints, step-by-step illustrations and directions so simple even a Muggle could follow them. 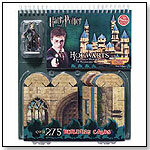 The set also comes with a custom-molded Harry Potter figurine. Launch date: May 2007. — Licensed products may be frowned upon in specialty stores, but don’t tell that to the smiling retailers who are profiting from the super combo of best-selling Klutz books with super-hot Harry Potter. It’s a new item, but it’s already made the radar blink. That’s why it’s a winner of a TDmonthly Top Seller 2007 award. — This set is a top seller Brain Station and Tree Town Toys in Ann Arbor, Mich., Owners Hans and Tricia Masing told TDmonthly in fall 2007. This Klutz card game package provides definitive rules for the "best card games in the universe", along with the 52 tools of the trade and complete plans for an architecturally sound house of cards. 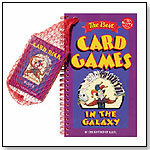 The set includes the booklet with rules and instructions, as well as a net pouch containing the deck of cards. Included in the booklet as "Best Card Games in the Galaxy" are such classics as Concentration, Rummy, Old Maid, Crazy Eights, and much more. — "I do well with the Klutz. They have the different card games — classic card games in a package with a book," said Donna Sedgwick, owner of Toy Mill in Tiverton, RI. How-to-Build Pirate Ships comes with a deck of 64 beautifully illustrated laminated leaves that break into 226 separate cards, cleverly shaped and notched to fit securely with every other card. Builders follow the book’s guidelines using an innovative design to assemble the cards into a sturdy ship in full sail. There are literally billions of different combinations in every pack, so one can make anything from a dinky dinghy to a super sailing vessel. It's written by Doug Stillinger. — Heather, manager at Toy Shop in Bethel, Maine, specifically predicted that the How-to-Build Pirate Ships Building Cards would do well with boys ages 4 to 8 during the upcoming 2007 holiday season. “My Very Own Horse Book” is the perfect item or gift for the horse lover. All the horse sense packed into the book can be applied to a hand-painted, collector-quality horse model that comes with it. Since no horse is complete without its tack, the materials and instructions needed for making a saddle, blanket and bridle are included. Every page features color photography and beautiful artwork. The book is written by Cornelia Thompson. "My Very Own Horse Book will teach readers everything they'd ever want to know about horses — from gaits and grooming to breeds and body language," said Samantha Wolfert, publicist for Klutz. — "They love horses, and the Klutz horse book is still popular," said Priscilla S. Moore, owner of Mr. Fub's Party "Toys and More" in Yellow Springs, Ohio, when predicting what girls ages 8 to 12 will prefer for the 2007 holiday season. Six of 54 retailers told TDmonthly that Klutz books will be hot with older girls for Christmas 2007. ― “Craft kits from Klutz are big for us,” said Dean Nelson, owner of Wizard Kids Toys in Toledo, Ohio, in June 2009. ― Pat Cooley, owner of Cooleykatz Toys in Livermore, Calif., named “My Very Own Horse” as a top seller for girls in her store, and 9 percent of 47 retailers said in summer 2009 that Klutz is a best-selling girls’ gift line.